Rakfisk is a traditional eastern Norwegian fish dish made from trout or sometimes char, salted and fermented for two to three months, then eaten without cooking. Fisk is the Norwegian word for "fish." Rak derives from the word rakr in Norse language, meaning "moist" or "soaked". Left: Rakfisk served with potatoes, lefse, onion and sour cream. Rakfisk is made from fresh trout or char, preferably over 750g. Remove the gills and guts and rinse well so that all the blood is gone. Scrub the blood stripe with a fish brush. Rinse the fish and put it in vinegar solution for about half an hour. Let the fish rest and the vinegar run off for a while. Then place the fish in a bucket with straight sides, close side-by-side with the abdomen facing up. Fill the abdomen with sea salt (60g per kilogram of fish). Sprinkle tiny amounts of sugar on the fish to speed up the "raking", but not more than a pinch for each layer of fish. Then place the fish under pressure with a lid that fits down into the bucket and a weight on top. The rakfisk bucket is put in a cold place (a stable temperature at about 4 degrees Celsius is the best, but it should be below 8 degrees Celsius at least). After a couple of days you should check if the fish is brined. If not enough fluid has formed to completely cover the fish, add salt brine containing 40g salt per litre of water. The fish may be placed at a higher temperature for some days to make it brine better, but one should be very careful with this. Leave the rakfisk for two to three months. Rakfisk is well conserved in the brine. When the fish is appropriately "rak," you can put it into a fresh 4% salt brine, which will slow down the "raking" process. Another method for slowing it down is to put the tub in the freezer (or outside if cold enough) for some time. As long as the fish is lying in the brine it will not freeze. The finished product does not need cooking but is eaten as it is. 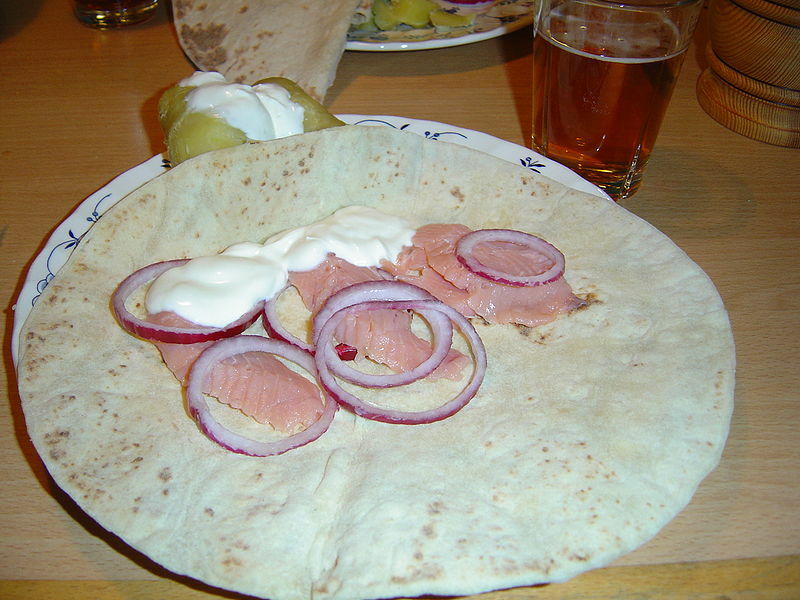 Rakfisk is usually served sliced or as a fillet on flatbrød or lefse, with raw onion, sour cream, and almond potatoes. Some also use mustard-sauce, a mild form of mustard with dill. Although not an everyday meal, approximately 500 tonnes of rakfisk are consumed in Norway annually. It is not recommended that rakfisk be eaten by people with a reduced immune defense or by pregnant women.